If you're going to murder someone, an important bit of advice to bear in mind is "keep it simple," especially if you're in ancient Egypt. Having a treasonous priest put to death is fine, but cursing him with eternal suffering, while I'm sure it seems like a satisfying idea at the time, is just going to lead to mummy trouble later on. And in comics, when it's hard enough keeping people six feet under at the best of times, fancy knives made of bits of crashed spaceship are thus a doubly bad idea: not only will it not work long-term, but people tend to be mad at you if you gut them. During ancient Egypt's 15th Dynasty, Princess Chay-Ara and her beloved Prince Khufu discovered a downed Thanagarian spacecraft. After their murder, the couple's exposure to the ship's anti-gravity Nth Metal has destined them to be reincarnated through the ages and fight alongside the Justice Society of America. Comic-reading Egyptologists probably have a chuckle to themselves at "Prince Khufu" - Khufu (aka Cheops) was of course the guy for whom the Great Pyramid was built, so when his name pops up in a superhero backstory like this, it does kinda smack of the writer just picking the first Egyptian thing he could think of. But All-American Publications (later absorbed into DC) deserves more credit for doing their research - the 15th Dynasty is where you find Apophis, who clearly had the means and inclination to shoot alien spacecraft (other than his own) out of the sky, so that explains what happened to the Thanagarian ship. So are we sure Khufu and Chay-Ara are actually being reincarnated, or is it just their Goa'ulds changing hosts? Next time Starro mind-controls everyone, it might be prudent to check if Hawkman and/or Hawkgirl is "mysteriously resistant" to it. 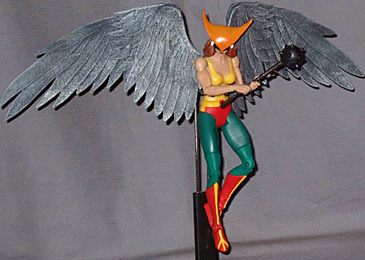 This figure is, of course, the first Hawkgirl (the first one published, that is), when the symbiont inhabited the body of Shiera Sanders - the costume is the giveaway for her vintage, she's got her underwear on outside of her pants like a good classic superhero should. Based on Hawkman's costume, and inheriting his somewhat poor taste yellow-red-green palette, though expanding the Flash-Gordon-hawkmen chest straps into a proper tank top, since comics weren't that adventurous back then. 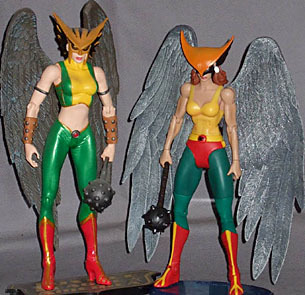 It's not entirely a recycled body - the top's edges are sculpted, as are the "claws" on the boots - but it's not exactly going to win any awards for originality; looking on the bright side, at least Hawkgirl isn't really physically notable in any way, so it's not like neglecting to make Big Barda big or anything. The wings are the figure's real party piece - both attach to a single vertical hinge sticking out of the back, and thanks to a swivel at the "elbow" they can be folded back or spread to a span of just over a foot, which on a 6½" figure is impressive any way you spin it, certainly moreso than the immobile folded wings the last couple of Hawkgirl figures have had to make do with. They're sculpted and painted decently, although the light grey drybrush which brings the feature detail out is a bit indifferent here and there - still, at full spread they really turn heads. Sadly not Shiera's, though - her hair all but locks her head in place, leaving it capable of turning only if it's also leaned forward (and not very far at that), and in addition the wings' hinge keeps the torso from leaning back at all; the two hindrances combine to give the figure a distinct tendency to slouch. The mask isn't removable, so all we can see of Hawkgirl's face is her lips and chin - which are nice, sure, but it's not a lot to go on. Oh, and her ears, because apparently you just can't go into superhuman combat without a nice pair of earrings. The mask has some nice detail to its inner edges, with feathers sculpted in much like the wings, but the paint there is flat black and does nothing for them - up on top, where there's a gentle fade from orange to orange-yellow, it's all smooth. The mask does sit forward on her face far enough for there to actually be a full head in there, which is more than the artwork on the package can say - artists have fudged the mask pretty indiscriminately over the years. She's got all the usual joints for a DCU female, but with the limitations mentioned above on the neck balljoint and pin sternum she's restricted in the poses she can manage. For the rest there're swivel/pin shoulders, swivel biceps, pin elbows, swivel wrists, a swivel waist, swivel/peg hips, swivel thighs, pin knees and pin ankles. The weight of the wings is always an issue, particularly if they're swung backwards on the shared hinge at all - I prefer Hawkgirl on a flying stand, since apart from making use of her wingspan, it gives her a reason to be looking down all the time. She comes with an oval base, which is technically for Giganta, but its single peg fits regular-sized DCUC figures just as well, and Hawkgirl really needs it if she's going to be on foot - luckily the big girl can do without just fine. 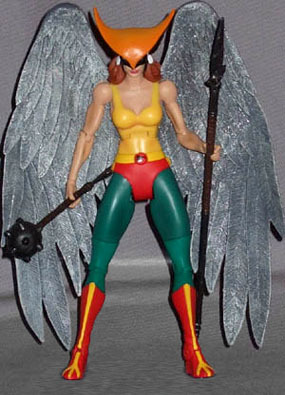 Hawkgirl also has three accessories of her own, all ancient weapons: a spear, a short sword, and her trademark mace. All three are cast in shiny gunmetal grey, with brown painted onto the handle wrappings, and the sword has little silver accents on its guard as well. Both hands are sculpted to grip, but only the right is firm enough to keep hold of a weapon - the left will only hold loosely, and is liable to drop the mace and the sword. It's all about the wings - Shiera's paint and sculpt don't really excel, and the pesky articulation and grip problems don't do much to help her. But the moment you open up her wings to their full span, you're glad you got her - and she is Hawkgirl, after all, it should be about the wings.